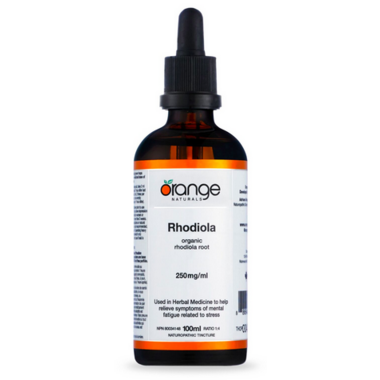 Rhodiola is a stress buster in a bottle. This extract is a traditional folk remedy believed to be helpful for those suffering from nervous complaints or excessive fatigue. It is used to increase physical endurance, work productivity, memory and even longevity! Greater longevity? Long live Rhodiola! Recommended Use: Helps to relieve symptoms of mental fatigue related to stress. Directions: Adults: take 1 mL, 3 times per day. Do not take immediately before bedtime. Consult a healthcare practitioner for use beyond 6 weeks. Ingredients: Each mL contains: Rhodiola (Rhodiola rosea, 1:5 root extract standardized to contain 3% rosavins and 1% salidrosides) 200mg. Cautions and Warnings: In case of insomnia, discontinue use. Contraindications: Do not use if you are pregnant or breastfeeding, or if you have a bipolar or bipolar spectrum disorder. Potential or Known Drug Interactions: Consult a healthcare practitioner prior to use if you are taking antidepressants, or if symptoms persist or worsen. This stuff is great. It tastes nasty so mix it into orange juice or something. Iâ€™ve noticed a difference almost immediately. It doesnâ€™t make me feel different, but I can handle stress better. Before taking this, everything was getting on my last nerve. Everything. Now Iâ€™m super chill. Second buy actually! I love it! Very good for students!